What to do & eat in Osaka Japan for a less than 72 hours trip? A lot. Definitely not enough for staying only 3 days in Osaka. We have a lot more to venture but summarize here is our TOP 14 favourites things to do in one of the Japan largest cities. The so called best Hakata-style Tonkotsu ramen in Osaka. We have not tried all ramen in Osaka but we do agree that Ichiran Ramen 一蘭拉麵 is delicious! Had our Ichiran Ramen at Dotonbori outlet, which opens 24hours. We queue for an hour for a bowl of ramen immersed in pipping hot, thick cloudy and flavourful pork broth. Another fun thing about Ichiran Ramen is their “dine alone table” concept. Each customer is assigned to one single seating, like the study carrels in collage school library. Noodles will be served to you right from the kitchen, through a wooden curtain blind. Transport yourself to the Wizarding World of Harry Potter through the platform of 9 ¾. Sip on butterbeer with magical taste, take a tour around Hogwarts and Hogmaedes. Take as many pictures as you wish to. Go on a ride of Forbidden city Journey. Frogs candy from the candy shop. Wear on full set of wizard attire, hold the wand and start getting your spells right. You will not want to leave. This was what we did almost everyday in Osaka. 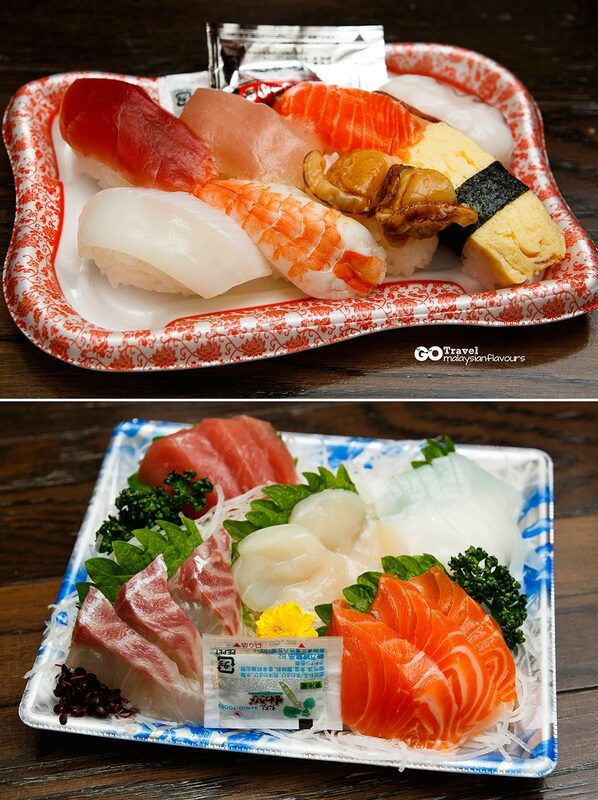 Since we stayed near to Osaka City ( Umeda subway – JR Osaka station), we bought discounted sushi and sashimi from 伊勢丹 ISETAN LUCUA departmental store every night. It is cheapest when the supermarket is about to close. A good deal for budget traveler like us. Walked around the store until like 8.30PM, and grabbed for cheaper price sushi, like two boxes of 2500yen sashimi plus sushi at only 1000yen. One of our favourite destinations in Ikeda, Osaka. At Instant Ramen Museum, walk through the tunnel of instant ramen & cup noodles with over 800 types of packaging, flavours; appreciating the born of ramen and its evaluation that makes it a “global food” in less than a century. 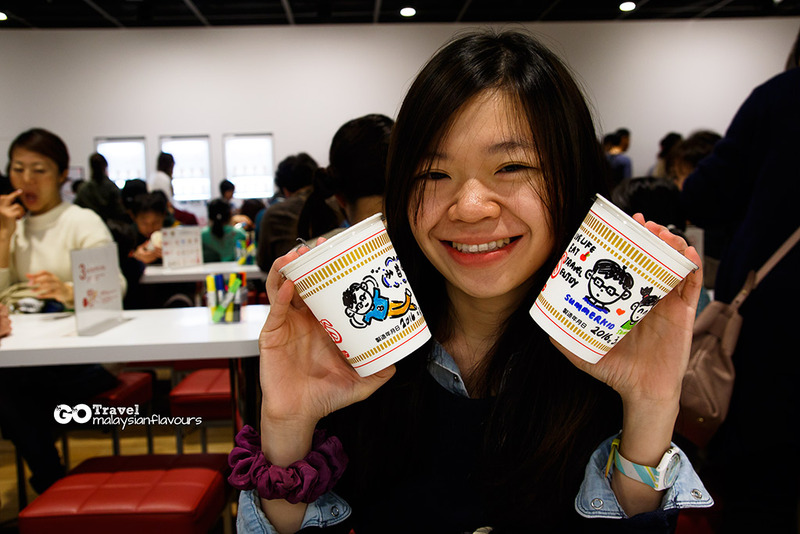 Then, DIY your own cup of instant noodle at Nishin Cup Noodle Factory. Draw whatever you want on mee cup, and choose the soup flavour and ingredients you like from the packing counter. Must have that Hiyoko-Chan little chicken mascot fish cake! Definitely a fun activity suitable for both adult, kids and families outing. Shinsekai probably is the old “New World” in the south of Osaka. It is developed before the war, with an iconic building, Tsutenkaku Tower 通天閣 which literally translated as “the tower to heaven”. 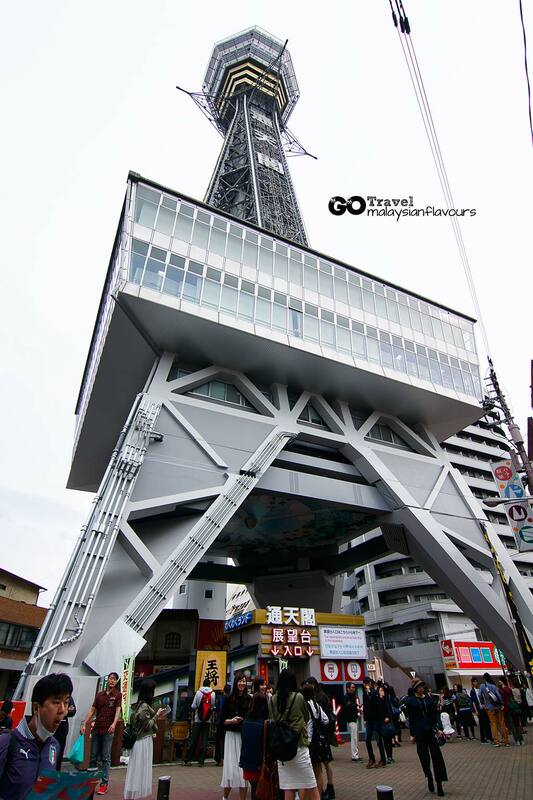 The 103 meters tall tower is now a tourist area, with observatory deck for a glance of Osaka from high up. Admission fee is 600yen per person. FREE when you enter with Osaka City Pass. 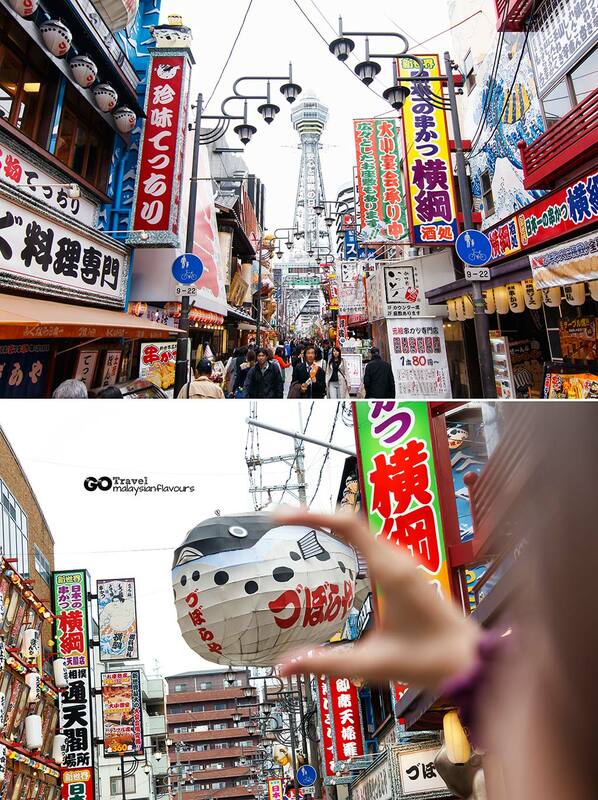 After visiting Tsutenkaku Tower, take a stroll around Shinsekai 新世界. The area has a shadow of Sungei Wang + Berjaya Time Square + Petaling Street in Kuala Lumpur Malaysia. Walking down the streets of Shinsekai, rows of shops selling clothes in hipster style. Shinsekai turns more lively at night when lights from all shops turned on. Pretty different ambience comparing to Shinsaibashi area. Remember to take picture with the 3D Fugu lantern, a prominent display by Zuboraya restaurant in Shinsekai. Kushikatsu, the must-have food in Shinsekai. 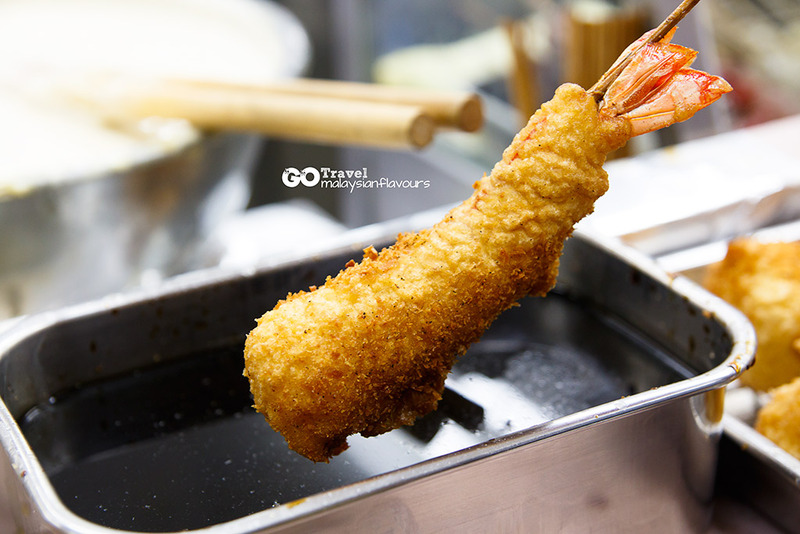 It is a battered, breaded and deep fried vegetables or meat on wooden sticks. Daruma Kushikatsu, Yakko Kushikatsu, Ganso Kushikatsu and Yaekatsu Kushikatsu are few of the most famous Kushikatsu in Shinsekai. We had ours at Yaekatsu Kushikatsu 八重勝串炸 . 100yen – 350 yen per stick. Best with a pint of beer. Do remember the “no dip twice” policy, which means you can only dip into the sauce provided for only one time for each stick. Shinsaibashi 心斎橋. The most lively, happening district in Osaka. Huge buildings with eye-catchy neon light displays, large high-street clothes stores and independent boutiques. Shopping paradise for those who love shopaholics. We personally don’t fancy this place as we love eating. To us, It is way too crowded and that covered shopping area was so long that we felt like we could never reach the subway station to get back to hotel. Worse especially when we walked on the wrong direction. 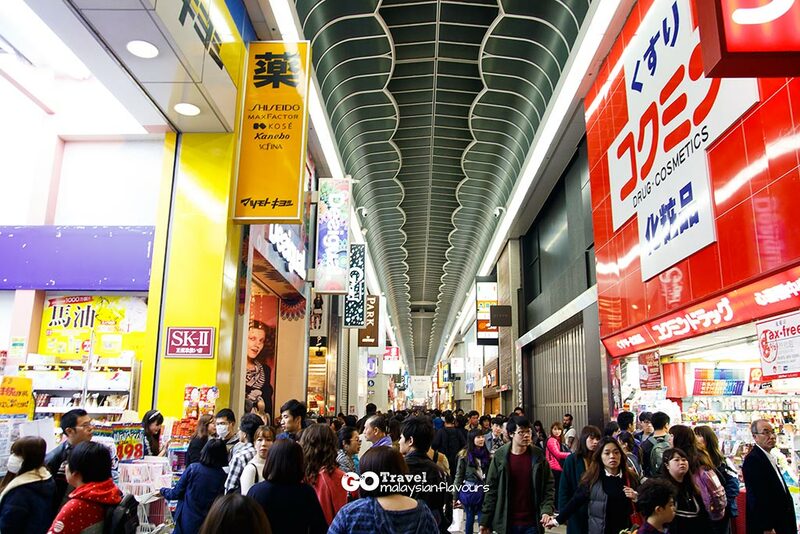 Must-do in Shinsaibashi – Put your hands up and take picture with Glico Running Man 固力果跑跑人. This giant board showcases a man running on blue track. Called Glico Man because it is put up by confectionary Ezaki Glico Co brand, the biscuit sticks coated with flavours like chocolate, strawberry, red bean and such. 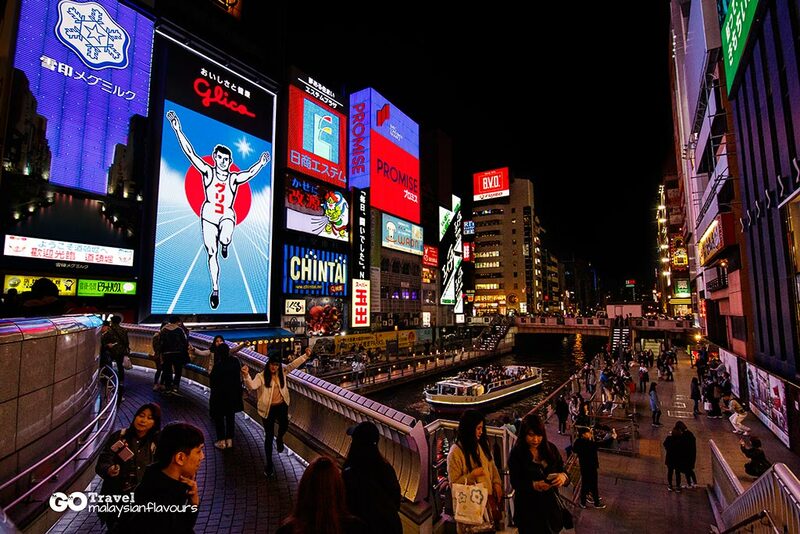 The 6th generation “ Glico man” start running over “different countries” from 6PM till 12midnight daily. There is a well-known Japanese saying like this : 京の着倒れ、大阪の食い倒れ . Meaning, “Dress in kimonos till you drop in Kyoto, eat till you drop in Osaka”. 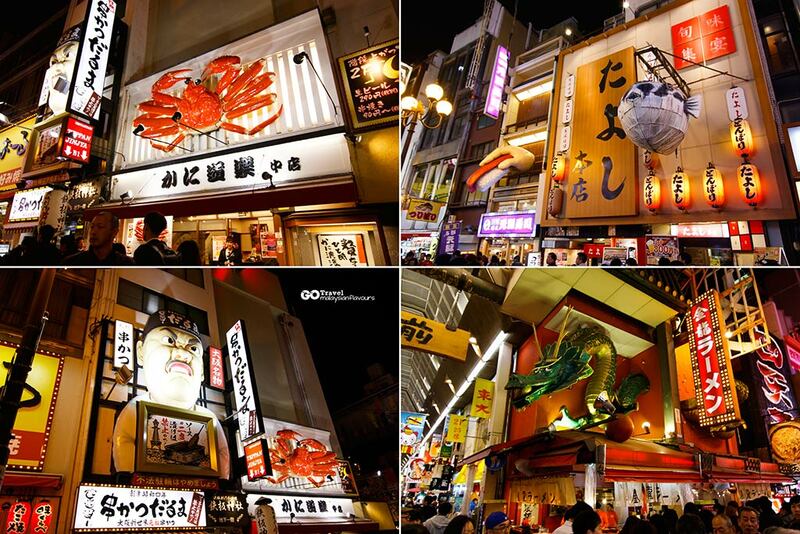 Dotonbori lives up to this proverb with ample of restaurants stretching out along the pedestrians and streets. Food selections are wide- takoyaki, ramen, sushi, crab, sashimi, dumpling, you get both traditional and modern Japanese food here. Those “huge 3D food signage” or “oversized creatures” hang outside the shop are photography-worthy though. “I hope I won’t get squashed flat by a giant dumpling” Summergirl said while carefully passed over a dumpling shop. Hahahaha. 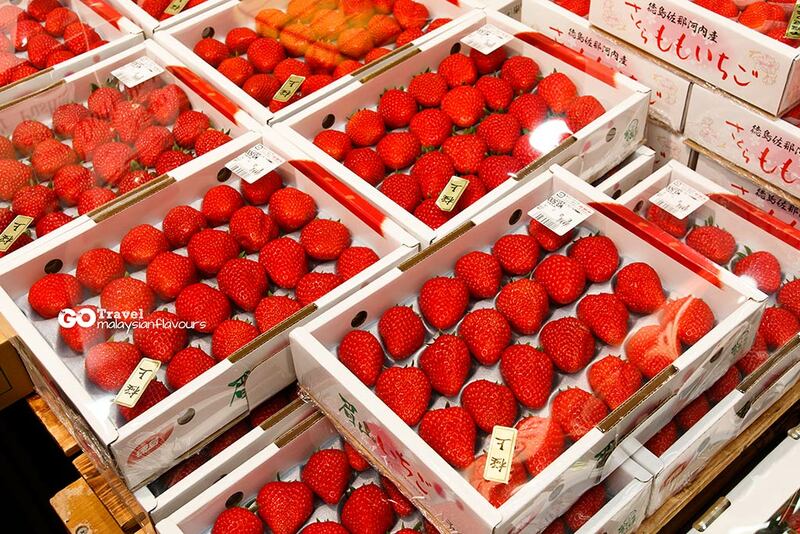 From greenhouse strawberry to luxury handpicked strawberries and Hatsukoi no Kaori, which is more known as the Scent of First Love, there is always a reason to tuck into sweet juicy strawberry when in Japan. Some are small as our 50 cents coins, while some are palm size big. Apart from eating fresh, enjoy them in different ways like sponge cake rolled with strawberry, strawberry and fresh cream sandwiched in bread, Daifuku aka mocha filled with red bean paste and whole strawberry, strawberry flavor Kitkat, Starwberry crepe and more. Price aren’t cheap but the freshness counts. Enjoy breathtaking night view of Osaka at Umeda Sky Building Floating Garden. Amazing 360 degree open-air observatory deck, with illuminating floorings. It is quite difficult to reach, with walking time of about 20 minutes from Osaka JR station. A help from navigation app comes important to us at that time. Expect to walk beside big roads, passing through tunnel, staircases and so forth before get welcomed with this modern sky scrapper. 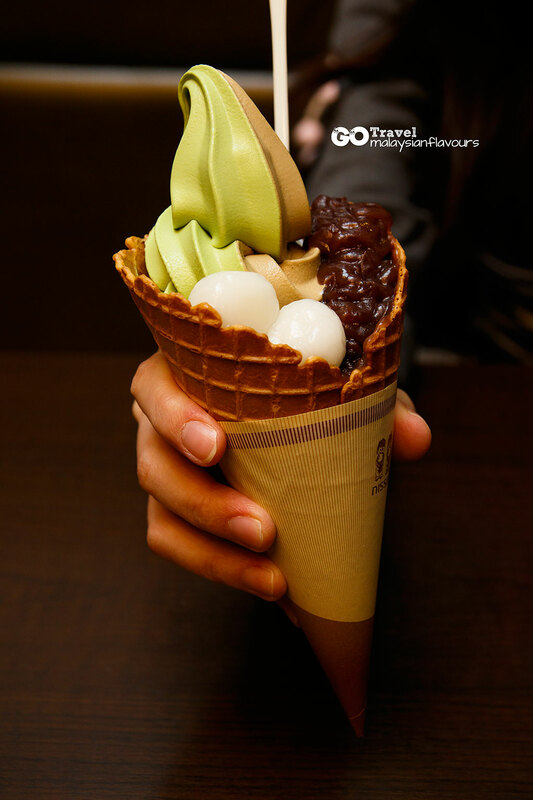 We had matcha ice cream and green tea ice cream twice everyday when in Japan. Had it from Kyoto to Osaka, yet still never get bored with it. An ice cream often tastes better when travelling. 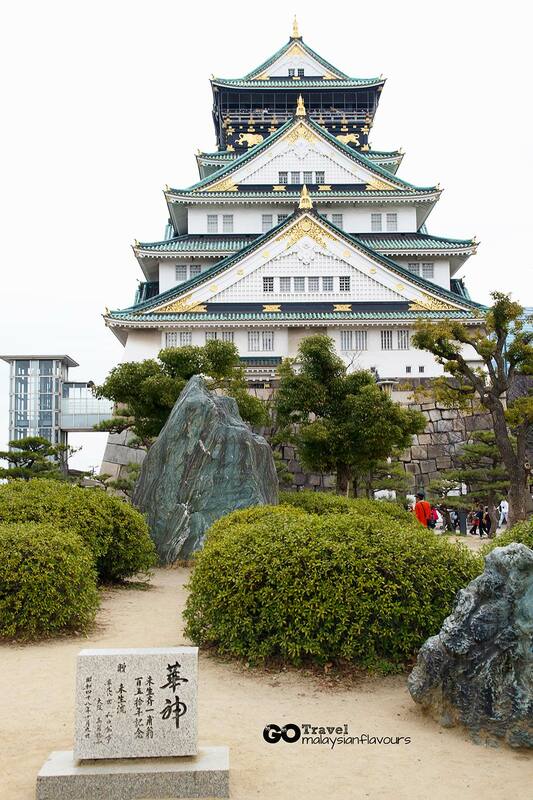 A visit to Osaka is incomplete without a tour to Osaka Castle. Famous landmark, carrying long history. This tourist attraction may not interest us much, but it is worth taking miles of walking from subway station to have a glance over this impressive architecture. For tourist with Osaka 1 Day Pass or Osaka 2 Day Pass, do pay a visit because admission fee into the castle is FREE if you have this pass. Else, 800yen will be incurred. You may also buy Osaka Amazing 1 Day Pass ( 2300 yen) or 2 Days Pass (3000yen) for travel convenience, with map to guide you through. With the pass specially designed for tourists, you are entitled to free admission to many tourists attraction including HEP FIVE Ferries Wheel, Umeda Sky Floating Garden, Osaka Castle, Tombori River Jazz Boat, Osaka Museum of Housing & Living, plus discounted coupon to many Osaka sightseeing. Since we are not too much into museum, aquarium or zoo, we plan on our own Osaka itinerary. Your blog is very interesting and helpful for my upcoming trip to Osaka and Kyoto end of next month. 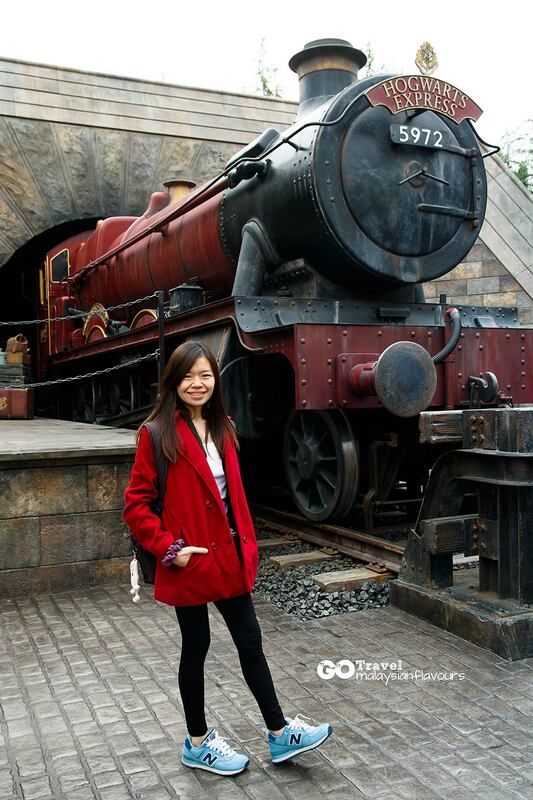 Can I know if you bought the express pass for USJ? If not,did you managed to play the rides? This is a very amazing blog and i like it very much. Thanks for sharing.